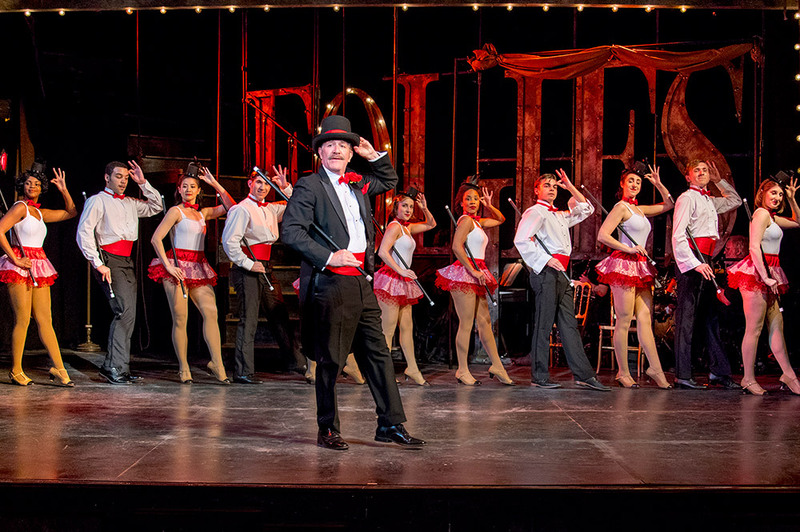 Bruce Sabath and cast in FOLLIES. Photo by Michael Dekker. Stephen Sondheim’s Follies, currently in performance by the Astoria Performing Arts Center (APAC) through the end of this month, expounds on such universal themes as love, innocence, loss and nostalgia. 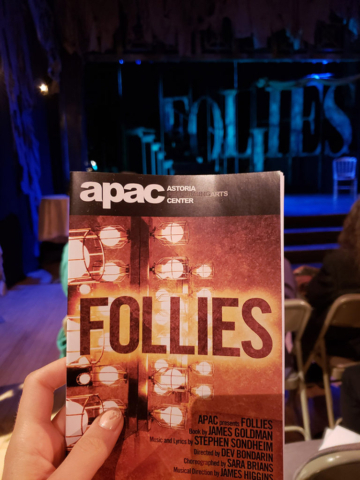 First performed on Broadway in 1971 where it won seven Tony awards (with two additional revivals), Follies begins in 1971 with the reunion of several of the “Weisman girls” at the theater where they performed back in 1941 between the two World Wars. The theater is about to be torn down and turned into a parking lot so this reunion represents the “last hurrah” of all those involved. While each of the women remember their younger days through dance and song, ghosts of their 1941 selves appear and immerse the audience in a multigenerational experience. While all the girls there look back to what they used to be, the central story line concerns two main couples: neurotic Sally (Tina Stafford/Andrea Dotto) and her salesman husband Buddy (Greg Horton/Spencer Hansen), and embittered Phyllis (Marcie Henderson/Tia DeShazor) and her famous politician husband Ben (Bruce Sabath/Ben Northrup). Sally and Phyllis lived together while they were Weisman girls, and were subsequently courted by the two gentleman callers. As often occurs in musicals, both women were in love with the same man: emotionally distant Benjamin Stone, who in the present day is unsure whether he ever knew how to love at all. This all builds to a climax near the end of Act II, when all the main players realize that their nostalgia and longing for the past is simply not enough to change the present. 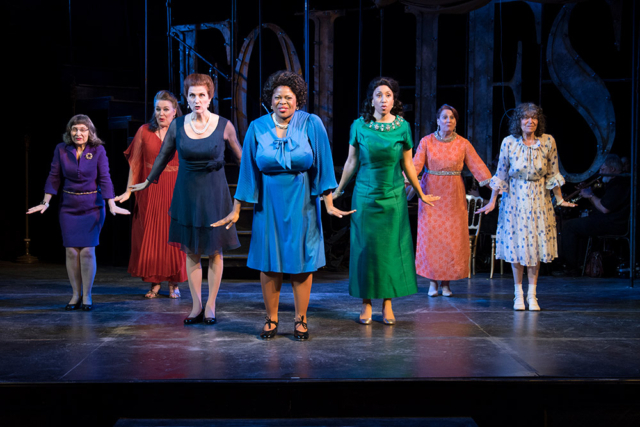 The lead actors are all superb in their own right, but it is the choreography by Sara Brians and direction by Dev Bondarin that allows the entire cast to shine. My favorite numbers were those where the 1941 and 1971 characters intertwine so you no longer remember which one is the present and which in the past. 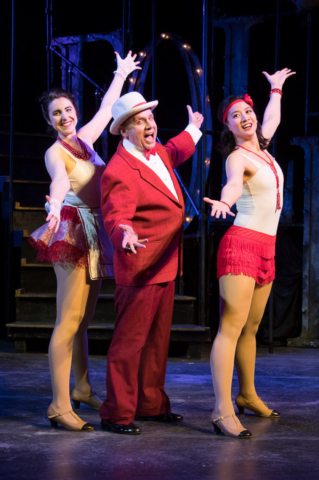 In addition, APAC’s understated set allows you to hear, see and feel the cabaret numbers in their pure emotionality. Who among us has not experienced regrets about lost love, how life might have gone if another path had been chosen? APAC has managed to take a master’s work and breathe fresh life into it. Casting Director: Jason Styres, CSA. Transportation: Queens-Bound N or W Train to Broadway. Tickets on sale now at www.apacny.org; Tickets are $18 for adults and $12 for students and senior citizens, in advance.